It is hard to believe, but there is only one note like this known to exist. And we are counting all territorial banks. These were only printed between 1875 and 1878; so the output was small and survival rate is poor. 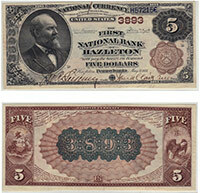 The exact value of any national bank note is just based on the condition and bank of issue. Please contact us if you need an exact value. Don't forget to check the serial number. Number 1 notes always sell for nice premiums.